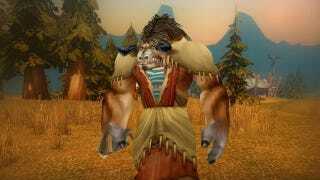 Meet Irenic, a Tauren Druid. Irenic is a level 90, the new maximum a World of Warcraft character can reach. And Irenic did it without killing a single thing. Sure, this sort of thing has been done before. But that was only to level 85. This is to level 90. That's five more levels of pacifism and what must surely be mind-numbing boredom. They got there by "doing archaeology and gathering in Kalimdor". For twelve days.